Legal to drive on the street. That’s the best specification on the 2012 Mercedes-Benz SLS AMG, a vehicle that has more engineering smarts just in its brakes than other cars have bumper to bumper. As you drive one, you feel as though you’ve gone from a traditional car into some super-futuristic transport pod, one that has many of the same characteristics as a Formula 1 racer. 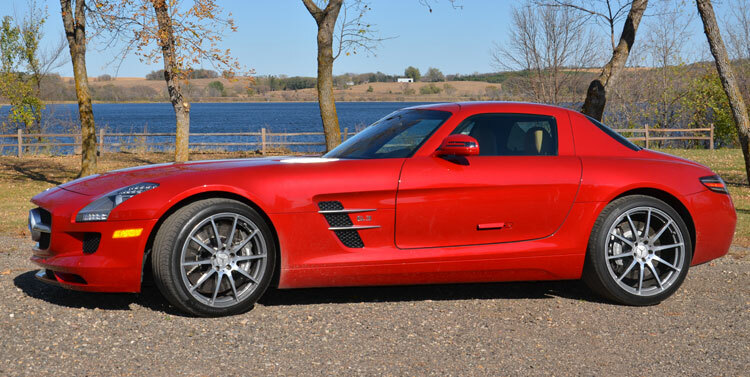 Another important spec you’ll notice right away on the SLS: This is a front mid-engine car. That means the 563-horsepower, 6.2-liter V8 engine sits just behind the front axle, explaining the unusually long front. Just turning on a street corner feels like the car has rested on a turntable that is turning you onto another road. Imagine what the corner at 100mph is like when a right angle is that smooth. During our test (Mercedes only lets reviewers borrow the SLS for two full days), we took the SLS out on a private road for some high-speed acceleration tests, cruised around on a winding country road, and frequently just gawked in wonder at this luxurious ride. We’ve never had quite as much fun on a test drive. The car is a magnet for crowds. Pulling up to a local school, at least 25 people crowded around the vehicle, and a few were brave enough to ask just to sit in the cockpit. There’s something peculiar about the styling, and we mean that in a good way. The car just has a unique vibe, as though the designers at Mercedes decided to pull this one out of a hat. In truth, it is the first AMG designed entirely from the ground up instead of just a branding effort by Mercedes. When you first slide in, there’s a cocooning effect that makes the SLS feel like it is meant for racing. Mercedes went to great lengths with this vehicle to make sure it is a smooth ride for long trips, as opposed to the “50 mile” supercars that are not comfortable for long after you leave the driveway. Yet, there’s a voracious roar even at idle. Stepping behind the vehicle, you hear a unique gurgling sound that makes the Corvette Z06 sound like it’s a babbling brook. The crowd that gathered once around the SLS lurched away in a panic when we revved the car – it sounded like the rear dual exhaust could cause a road fissure. The SLS is not exactly punchy, though. With a rating of 479 lb-ft of torque, it’s more accurate to say the SLS is ready to gobble up the road. Our own 0 to 60 test clocked in at 3.9 seconds (the official rating is 3.7). The SLS has a unique launch control mode where you push the brake down all the way, press the accelerator, and then release the brake. You have to turn a switch to RS mode. The cars revs to 4000RPM and then launches, shaving a few milliseconds off your 0-60 time. What does it feel like? The SLS has that explosive rocket launch feel of an Audi R8, especially through the first two gears. We experimented with the various drive modes: C for Comfort, Sport and Sport+ modes, and manual. In manual, we could punch the SLS up to about 7200RPM before the automatic fuel cut-off kicked in. By comparison, the Cadillac CTS-V has a fuel shut-off at 6200RPM. In practice and in numbers, this equates to more power out of the engine. 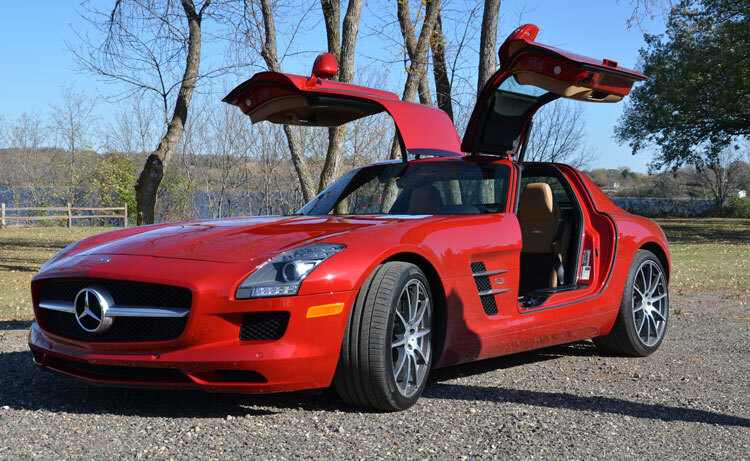 On a private road, we hit 140mph and the SLS was hardly blinking. The speedometer shows 240mph, but the car is rated for 197mph as a top speed. For cornering, the SLS is smooth as silk. You just don’t notice corners. We’ve tested some performance cars in the past few months, including a Corvette Z06 and a Nissan 370Z, but they were no match for the cornering capability of the SLS, which as an adaptive suspension that reminded us a bit of the Audi A8. 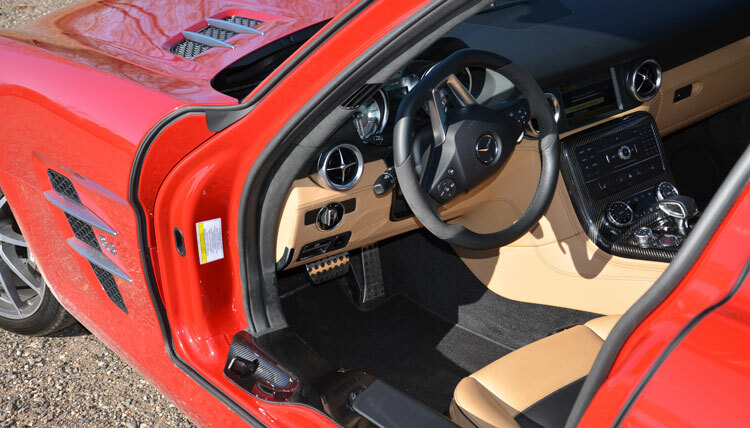 There’s the same Jell-O-bowl shift of the Z06, but the SLS uses an electronic system for adjusting the ride. In practice, this meant there is a noticeable shift in weight as you corner at high speeds, helping you ease around a bend without that panic feel where the car seems to drift off the road. The SLS is not light on tech features, either. The 1000-watt stereo from Bang & Olufsen, which adds $6,400 to the price, matched the quality of the stereo system in the A8: loud, distinct, and full of bass during several tests with alt-rock bands like Future Islands and Thursday. The interior is lush and comfortable, although there’s not a lot of storage space inside or in the trunk. Some of the wonders of this supercar revealed themselves slowly over time. We didn’t notice right away that the rear spoiler pops up from the trunk at 72mph and recedes at 50. (You can also press a switch to use it any time you want.) Several traction control settings let you adjust the ride, and one even disables traction control altogether for a more road-sensing feel (and potentially more slip). 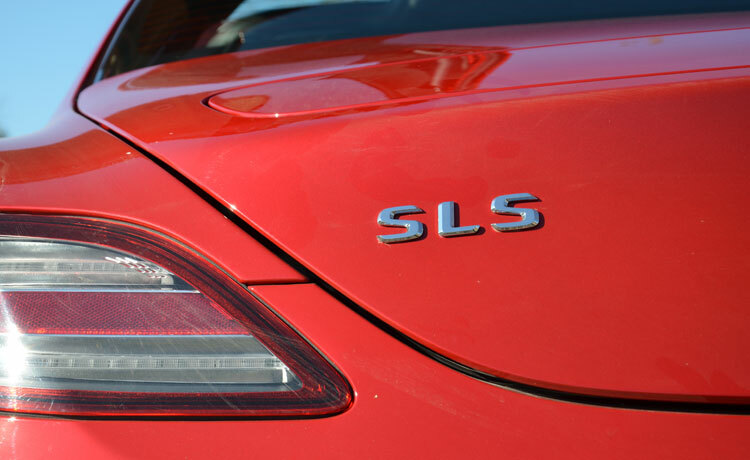 The SLS does not include any of the hallmarks of Mercedes-Benz technical safety, such as pedestrian detection, adaptive cruise control, or attention monitoring. (We’ll be putting those features through a series of tests this week in a Mercedes CLS 63 AMG.) We didn’t miss any of the technical wizardry of the CLS, though – some supercars don’t even bother with a radio. We had so much fun testing the SLS that we asked to test it just a few hours longer than scheduled. For around a $200,000 price tag (the exact amount depends options like the 1000-watt stereo and interior trim), the SLS Is not for everyone. But for anyone with the means, there’s little doubt the 2012 Mercedes-Benz SLS AMG delivers every bit as much excitement in the real world as the specs and pictures suggest. Also make sure to check out our 2012 Mercedes-Benz SLS AMG photo gallery.